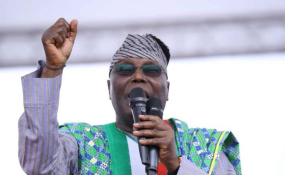 Former Vice President and Presidential Candidate of the Peoples Democratic Party (PDP), Alhaji Atiku Abubakar, on Sunday, reviewed the performance of President Muhammadu BUHARI'S nearly four years in office and returned a damning verdict that "the All Progressives Congress (APC) administration was one of the biggest disasters to have ever befallen Nigeria." Atiku, who spoke through his Special Assistant on Public Communications, Mr. Phrank Shaibu, said President Buhari's first term in office is "a sad reminder of Nigeria's arrested development since 2015 when his clueless party, the APC came to power." Phrank Shaibu, who said he unveiled what he described as "President Muhammadu Buhari's Hall of Shame" on Sunday in Abuja called on the Independent National Electoral Commission (INEC) to deregister the ruling APC, which, according to him, "has metamorphosed from a political party to a 'nest of corrupt politicians', as attested to by the party's National Chairman, Adams Oshiomhole who recently said that once any politician defects to the APC, he or she becomes a saint even if such a person were an armed robber." "It is the view of the Presidential Candidate of the People's Democratic Party (PDP), Alhaji Atiku Abubakar that Nigerians from all walks of life call on the APC to apologise to all Nigerians for bringing them nothing but suffering of unquantifiable proportion since 2015, and to make a solemn pledge not to have anything to do with governance, especially with the February 16, election that is fast approaching," Shaibu said. He said the Buhari administration was only chasing shadows by trying to drag Atiku Abubakar into the mud, "which has now become the natural habitat of APC top leaders." "President Buhari and his APC are enablers and harborers of looters of our collective patrimony and this document 'Buhari's Hall Of Shame' is a scorecard of failure, incompetence, nepotism and a President's proclivity to harbouring indicted and other famed thieves of our patrimony. "Recall that, the former acting Director General of the National Intelligence Agency, Ambassador Mohammed Dauda, in a sworn testimony to the House of Representatives Committee on National Security and Intelligence, revealed that President Buhari's kitchen cabinet, comprising Abba Kyari and former Secretary to the Government of the Federation, Babagana Kingibe, had pressured him to share the $44 million Ikoyi millions. After giving his sworn evidence, Ambassador Dauda was dismissed and has now gone underground. This is President Buhari's style of fighting corruption. "The hawks seem to have finally convinced Buhari to frame Atiku in some bogus N156 million alleged scam, which they claimed is responsible for the collapse of Bank PHB. Assuming but not conceding that this allegation is correct, can N156million Naira collapse a bank with a reserve portfolio in excess of N25bn? But Nigerians are wiser and I am sure, would resist any devilish plot by some APC crooks who believe that it is either the President wins re-election or our democracy is truncated," Atiku said. "By this latest allegation of the Federal Government through the office of the Minister Of Information, it is clear that the responsibility of AMCON has been appropriated. In appropriating the responsibility of AMCON. It is therefore no more a matter of speculation that Buhari and his family members are the new owners of Keystone Bank (Former BankPHB)." The former Vice President then asked, "what is the Assets Management Corporation of Nigeria (AMCON) doing before now when it refused to name Atiku as one of those behind the collapse until now that the leaders of APC see that he is just a few days from becoming Nigeria's president, and wondered whether the revelation is at the instance of the new owners. The former VP described the Bank PHB story as "diversionary and a calculated attempt to divert the attention of Nigerians from the failure of the APC government to deliver the dividends of democracy. Shaibu said "the exchange rate of the Naira to the US dollar when the APC assumed office in 2015 was about 170 (official rate) to the dollar. Today it is 360 to the dollar. What more evidence do we need to know that the APC has been a curse rather than a blessing to our country?" He said "Atiku Abubakar's policy document focuses on job creation, ensuring security, growing businesses, developing power, and water infrastructure, agriculture and education and how 'Nigeria's next president will empower women. "Unlike Buhari's policy proposals, our policies outline the goals and methods for developing and revitalizing Nigeria and getting the country to work again," Shaibu concluded.